Gouache and watercolour and pencil on card. Cutcloth showing a scene with 'The Tents of a Travelling Fair' in the pantomime Humpty Dumpty, London Palladium, 1959. 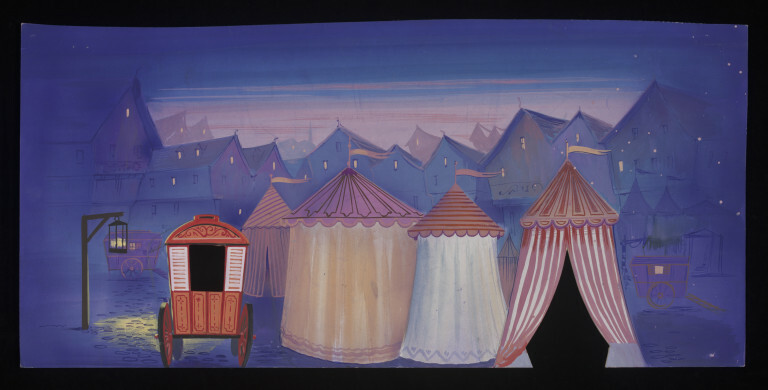 Cutcloth showing a scene with 'The Tents of a Travelling Fair' in the pantomime <i>Humpty Dumpty,</i> London Palladium, 1959. 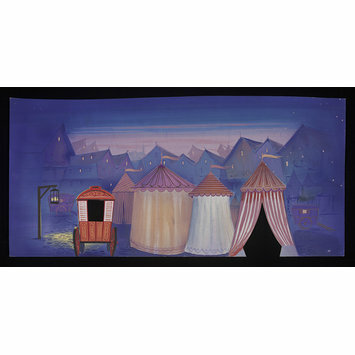 The night time scene is painted in tones of purple, blue, pink and red. It features a series of tall circular tents with their high roofs surmounted by flagpoles and flags. Two small wooden painted carts stand to the left of the tents, the cart in the foreground is painted in tones of red and white and supported on large, round wheels. The scene is illuminated by a lantern which hangs from a wooden pole at the left side of the scene. A series of houses, suggesting the distant town, are visible in the background.